UP B.Ed 2019: UP B.Ed Admit card is available from 8th April 2019. The Exam of UP B.Ed 2019 is on 15th April 2019. Uttar Pradesh Bachelor of Education Joint Entrance Examination (UP B.ED) is conducted for the candidates interested in taking admission to B.Ed course. This state-level exam is conducted by Mahatma Jyotiba Phule Rohilkhand University, Bareilly for the admission to Government colleges. Candidates interested in taking admission will have to fill up the Application form of UP B.Ed 2019 and submit it before the due date. The form are released on the official website. The Registration for UP B.Ed 2019 was started from 11th February 2019. Every year thousands of candidates appear for this exam in order to acquire admission to B.Ed course in various colleges of Uttar Pradesh. For more of the details of UP B.Ed 2019, go through the article below. New: The Admit card for UP B.Ed Exam 2019 is available from 8th April 2019. The exam is on 15th April 2019. The applicant must download the document by providing the required details. 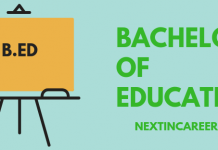 Find UP B.Ed Admit Card 2019 here. New: The Last for the submission of UP B.Ed Application Form was extended till 14th March 2019. The complete Application along with the Application fee had to be submitted till 16th March 2019. The Application Form correction window was available from 13th March till 17th March 2019. New: The Application Form of UP B.Ed 2019 was released by Mahatma Jyotiba Phule University, Bareilly on 11th February 2019. The schedule of UP B.Ed 2019 is released by the examination conducting body on the official website. Candidates planning on appearing for the exam are advised to keep themselves updated with the release schedule of UP B.Ed. Find the schedule of UP B.Ed 2019 from the tabular format below. The Application Form of UP B.Ed 2019 is released on the official website. The Application form is an important step in order to proceed for the admission procedure further. Candidates will have to fill up the Application form and submit it before the due date. The admission conducting body has also released the information brochure along with UP B.Ed Application Form 2019. Candidates will have to go through the instructions mentioned in the brochure. The Application form of UP B.Ed 2019 will contain the section to be filled with the Personal Details, Academic details, Contact details. Candidates applying should make sure that the details mentioned are valid and correct and any form of invalid information will lead to the cancellation of the candidature. The information provided in the form will be cross-checked at the time of final admission and any form of wrong detail will cancel the admission. Candidates are also advised to go through the eligibility criteria as defined in the information brochure. Uttar Pradesh B.Ed Joint Entrance Exam is applied by thousands of candidates every year for the admission to B.Ed course. Applicants planning on applying for 2019 session will be required to keep themselves updated with the latest released notifications. The Applications forms are released online, applicants filling up the form will be required to go through the eligibility conditions very thoroughly and then proceed for the form. In case the eligibility is not fulfilled, the candidate will not be granted admission to the course. Find the eligibility criteria in the points below. The candidate applying for UP B.Ed 2019 must be an Indian Citizen. The candidates from Science/Social Sciences/Humanities category must have secured 50% marks in UG from a recognized University. Candidates who have done their graduation in B.E./B.Tech must have secured 50% marks in aggregate in Mathematics and Science. Candidates appearing for the exam of UP B.ed 2019 is required to download the Admit Card on the day of the entrance exam. UP B.ed Admit card 2019 is available on the official website of the examination conducting body. It is mandatory for the candidate to bring the Admit Card on the day of the exam, it should be noted that its absence will lead to the cancellation of the candidature. UP B.Ed Admit Card 2019 mentions the details important for the candidates appearing on the day of the exam. The contents that are mentioned are Name of the candidate, name of the course, Venue of the examination, Timing of the exam, exam centre, Course code, important instructions for the candidates to be followed on the day of the exam. The details mentioned on UP B.Ed Admit Card 2019 should be thoroughly verified by the candidate. In case of any form of discrepancy, the examination authorities should be immediately contacted. Candidates who will be appearing for UP B.Ed 2019 can download the Answer Key which will be available on the official website. 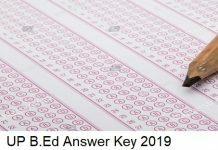 UP B.Ed Answer key 2019 will help the candidate in the evaluation of their marks in the entrance exam. The Answer Key of UP B.ed 2019 will mention the correct answers to the questions asked in the entrance exam. Candidates will have to download the Answer Key which will be available a few days after the exam and cross-check the answers attempted by them to the answers marked in the Answer key. By calculating the correct marked ones, the possible score can be evaluated. An opportunity of objecting to the answers in the answer key will also be provided to the candidates, in case the answers marked in Answer Key are found to be incorrect. The window to object answers will be opened only for a few days, candidates should make sure to apply in the given period of time. 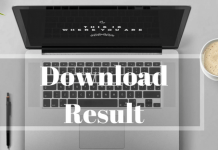 Candidates will have to provide the asked credentials in order to download the copy of UP B.ed Answer Key 2019 successfully. Uttar Pradesh Bachelor of Education 2019 exam will be conducted for the admission of the candidates to the B.ed course offered by the Government aided colleges of Uttar Pradesh. Up B.ed Cut Off 2019 will be released by the examination conducting body for the candidates to check if they are eligible for the admission to the course or not. The cut off marks will be released by the colleges as per the aggregate scores secured by the candidates in the entrance exam. The opening and closing rank as mentioned by the colleges will help the candidates in check if they are eligible to proceed for the admission procedure further or not. The Result of UP B.ed 2019 will be published on the official website after the successful conduction of UP B.ed exam. Candidates who appeared for the exam and gave the test will be able to check their result and download the PDF file mentioning the details of the candidates. UP B.ed Result 2019 will be accessible to the candidates who gave the exam after providing the asked credentials in the Login section. It is important that the details provided in the section of the Login is valid and correct, the result will be shown invalid otherwise. In order to proceed for the admission procedure further, it is important to qualify the exam. Only those candidates who will be passed as per the cut-off score decided by the examination body will be called for the admission procedure further. It should be noted that merely qualifying the entrance examination will not provide any form of assurance of admission. The final seat allotment will only through the counselling procedure depending on the score secured by candidate and number of seats to the applied college. Candidates who qualify UP B.ed 2019 exam will be invited for the counselling procedure. UP B.ed Counselling 2019 will be held for the final seat allotment to the applied college. Students will be provided with the seat allotment letter mentioning the date and venue of counselling, timing to report at the centre, documents required at the time of counselling for verification. Candidates should make sure to go through the details mentioned regarding the counselling very carefully. Candidates will be called as per the rank achieved by them in the entrance exam. UP B.ed Counselling 2019 will be held on the scheduled date and candidates interested in taking admission will have to report at the allotted centre. Qualified candidates will have to go through the procedure of Registration, Payment of the counselling fee, choice filling, seat allotment and reporting to the college. The allotment of seats will be held through First Counselling, Pool Counselling and Direct admission. It will be important for the candidates to be physically present on the day of the counselling. ITEP se related koi bhi information abhi available nahi hai or naa hi ye pata hai ki 2019 session mei ITEP mei enrol ho sakte hai ya nai. Koi bhi nayi detail aate hi article mei update ho jayegi.